Lightning Powder 3-3878 Evidence Packaging Kit FREE SHIPPING! Carry all items needed to track, secure and transport evidence at any crime scene with the Evidence Packaging Kit from Lightning Powder. 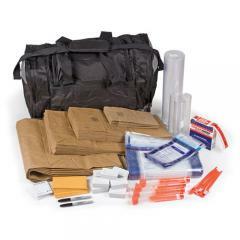 With all essential supplies for processing virtually any crime scene packed into one durable, expandable bag, the kit is easily carried from the car to any location. Three packages of different sized paper evidence bags, large kraft bags, coin envelopes and two packs of security bags offer secure item storage needed to inventory nearly any piece of evidence--big, or small. Evidence boxes, tubes and Eva-Safe syringes provide additional item storage and secure transport options. Ample labels and sharpie markers ensure all items are properly tagged, marked and categorized for smooth case handling. A 108-foot roll of evidence tape clearly seals and marks all boxes, packages and bags. ©2002-2019 CopsPlus.com: Lightning Powder 3-3878 Evidence Packaging Kit FREE SHIPPING!